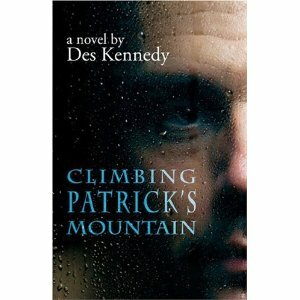 Climbing Patrick’s Mountain is bestselling author Des Kennedy’s haunting and elegant tale about coming to terms with one’s past. Expatriate Irishman Patrick Gallagher, an accomplished but eccentric breeder of prized roses, returns to Ireland as a celebrity host to lead a tour of Irish gardens, and hopes to attract the eye of a wealthy patron to donate funds to his garden back home. What is planned to be a pleasant and lucrative trip soon becomes a voyage of overcoming a painful history as the protagonist encounters the very reasons he left Ireland in the first place. Just as Patrick begins to reconcile with his demons, time runs out in a poignant conclusion. A vivid coming-of-middle-age story set in today’s Ireland, Climbing Patrick’s Mountain embraces the contradiction of the Irish sensibility: grand humour in the face of ultimate tragedy. Let me start by saying I know Des and have loved his gardening presentations and his amazing wit and command of the English language. When I heard about Des Kennedy’s new book – Climbing Patrick's Mountain – I was curious – when I found it was a novel of fiction set in Ireland about a tour host – I had to read it. I anxiously dug into it when it arrived. I haven’t written this review for more than a couple of months after finishing the book. Initially I enjoyed getting to know Patrick, a recluse in Vancouver hovering over all his precious roses. His crusty, “leave me alone” attitude was interesting and I liked how Des set up the trip to Ireland. It was here where I found myself struggling with knowing Des and reading about Patrick. Silly I know. I know Patrick is fiction but I have come to love Des’ wit and love of life. I found Patrick and his life so dark and so opposite of Des that I while reading the book I had to keep reminding myself this was not an autobiography but fiction. The Ireland Des portrayed in the book was so different than I’ve known vicariously through Des and my wife Donna on their various trips to Ireland while doing garden tours. I think I would have initially enjoyed it had it been written under a pen name. But that’s unfair to Des. It’s my problem not his. The story is well developed and the characters memorable. As a piece of fiction it would make a fun movie. Not sure who I would cast as Patrick but someone like Ralph Fein comes to mind. Read the book – put out of your mind that Des wrote it – just enjoy the book.